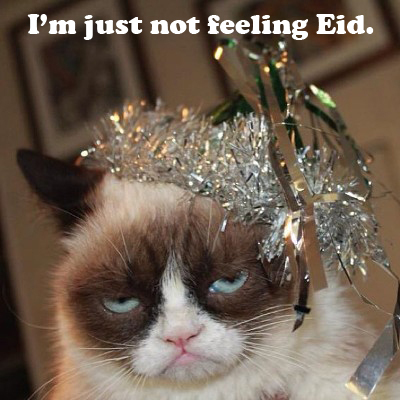 Honestly, I'm not really excited about Eid ul-Fitri. I don't know if it's because I'm down with a terrible flu (that's what happens when I stop taking my supplements! ), or because I'm tired from work, or the fact that Eid hasn't been the same for us ever since my Dad passed away. I'm not feeling it at all. Having said that, do you know why it's called Eid ul-Fitri? Because we're celebrating the fact that fasting and increasing our acts of worship during Ramadan has helped us to return to our fitrah (natural state) which is in submission to Allah's will as opposed to submitting to our ego's desires (nafs). To be a Muslim means to be someone who submits to God's will. "You are now an individual with a purpose—seeing the world through a different lens. You have a mission to be living, doing, and speaking only for His Sake. In that, you have truly become independent. In other words, realizing that your independence comes from being dependent on Him as opposed to your own nafs or this world and what it contains. Thus, for the one with a purpose, who has a vision and understands their mission, the outlook in this world changes. This dunya (this life) becomes a place of opportunities and a place to accumulate wealth (in the form of good deeds) for the hereafter. Every trial they come across in this world becomes an opportunity to be patient and content. Every blessing they’re given and witness around them becomes a means of being thankful and humble. Every temptation they struggle against they see it for what it is; a mirage meant to deceive and entrap their soul. I guess I do have something to feel excited about, after all. Alhamdulillah! I loved this post, I’m not very thrilled about this Eid too, for so many reasons. But I’m always fascinated by this concept of by depending on Allah we actually free ourselves from the craziness of dunya and any kind of elusive attachments especially with other mortals, thus we truly become independent and we’re left now to be ourselves and not a copy of any other person or forced to follow any unsuitable trends and deeds others force upon us. Salam Sha!Syafakillah, get well soon plenty of rest! Eid Mubarak! Hope you're feeling better now. @Haneen, Shahi is really cute :) Hope you had a good Eid too!